Just over a year ago, Brandeis kicked off a process to create a new comprehensive Strategic Plan that will help guide the university for the next 10 or even 20 years. From the outset, I knew we would have to take a highly inclusive approach. I asked Provost Steve Goldstein to lead the effort, and he has chaired a steering committee that includes more than two dozen representatives from across the Brandeis community: deans and faculty, senior administrators, students, alumni and trustees. In group sessions large and small, through individual conversations and in special meetings of groups within the university, the committee and its task forces gathered input from more than 1,000 members of our extended community and sifted through hundreds of ideas and proposals. In October, the committee released a preliminary framework for the Strategic Plan. It was intended as a working document — one that we hoped would spark questions, conversation and an even deeper examination of some of the bold ideas under consideration. This framework focused on five broad themes: the academic experience, the importance of engaging our undergraduate and graduate students in the big questions facing our world, the need to strengthen our community, the improvement of our campus and the technologies we apply, and the need for continued stewardship of our resources so that we can achieve our ambitious goals. The preliminary framework generated wide-ranging conversation and extensive input. I do not need to tell you how passionately our community feels about this university or how much it loves a good debate. Or how many great ideas it can generate. 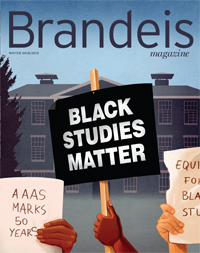 As this issue of Brandeis Magazine went to press, the process was still very much under way. We continue to refine the concepts and specific ideas under consideration. A draft of the Strategic Plan will be released to the community for comment soon, and the final plan will be presented to the Board of Trustees in late January. I cannot tell you everything that will be in that plan. But I think most of it, once you have time to digest it, will seem familiar in its boldness. We intend to build on the strength of the Brandeis model. As a great research university with a small liberal arts college at its heart, we have remarkable opportunities presented by the seamless integration of our undergraduate, graduate and professional schools. You, our alumni, know better than anyone that there is something very special about the Brandeis model. It may be that we all know this fact so well we almost forget how unusual it is. It provides us with the opportunity to offer the best of both worlds: the intimacy and individual focus of the undergraduate educational experience combined with the opportunities for students to go beyond that — in fact, as far as they wish to go — in pursuit of their own research, discovery and creativity. We wouldn’t trade this model for anything. So our challenge now is to develop the full power of our model. To do this, we need to identify areas of excellence and ensure that they remain in the top echelon. We need to look at those areas that need to be fortified in order to ensure that we move into the top echelon. And we need to agree on what areas we should expand into to address society’s changing needs. In all of this, we are invigorated by our historic commitment to social justice, our deep roots in the American Jewish community and the values that inspire us. Finally, we need to do this in a financially sustainable way that allows us to maintain the emphasis on small classes and individualized education, while still offering students — and faculty — innovative research opportunities. This is the challenge we are embracing, and I look forward to your partnership in the journey ahead.